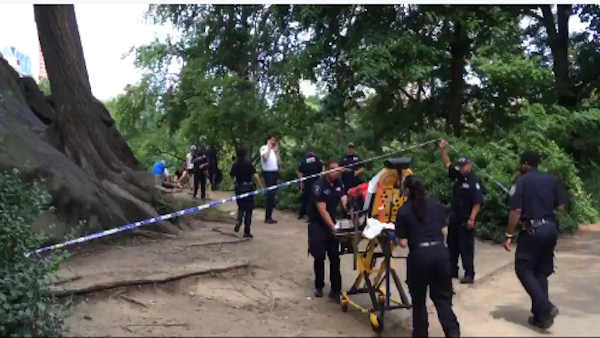 CENTRAL PARK, Manhattan -- At a press conference Sunday, officials said they believe an explosion in Central Park near Fifth Avenue and East 62nd Street was caused by an 'experiment' of fireworks or a homemade device. There is no evidence suggesting that the explosion was terror-related. The victim who was severely injured has been identified as 18-year-old Connor Golden from Fairfax, Virginia. Golden was walking with two friends when he stepped on something and it blew up, according to witnesses. Police said witnesses told them the man had just stepped onto a rock when an explosion occurred. People in the area said the explosion was heard blocks away. Police are still trying to determine who the device belonged to. The victim and his friends were cleared, and officers said they were innocent victims. "There's nothing to indicate that this was an explosive device that was placed or put in this area with a specific intent to harm an individual," says Mark Torre of the NYPD Bomb Squad. Officials say the device had been left in Central Park for approximately one day. "We were climbing down the rocks, Connor was 6 feet behind me and all of sudden I felt the explosion on my back," said one of Golden's friends, Thomas Hinds. "The explosion sounded like a gunshot next to my ears. I turned around and saw his foot which wasn't completely blown off but was severely mutilated. My other friend Matthew was behind Connor and all he saw was massive amount of dirt go flying up in the air." Golden suffered a severe leg injury, and was taken to Bellevue where he is undergoing surgery, facing a possible amputation. He is in serious, but stable condition. Authorities closed off part of Central Park as they try to determine what caused the explosion.